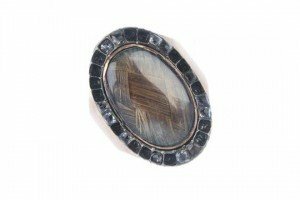 A George III gold and paste memorial ring, the woven hair panel within a paste border set to the tapered band. 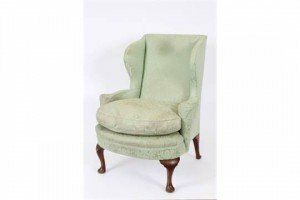 A George III style wing back easy chair, upholstered in celadon coloured cotton brocade, on walnut cabriole legs. 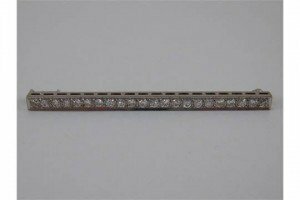 A white metal diamond bar brooch, the round brilliant cut diamonds of good colour and clarity estimated to weigh approx 0.70 carat total. 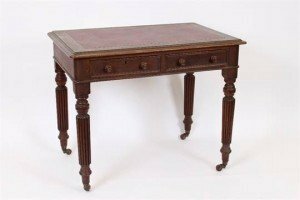 A Victorian mahogany writing table, rectangular top with an inset writing surface, fitted with two frieze drawers, turned and fluted legs. 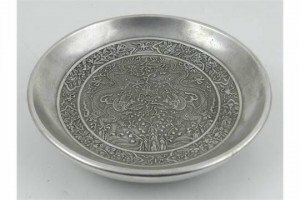 A Chinese white metal dish, decorated to interior with dragons chasing flaming pearls amongst stylised clouds within a floral border, bears four character mark to base. 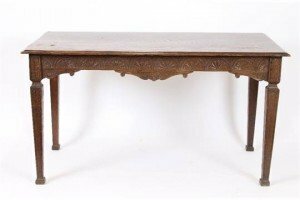 A Continental oak library table, rectangular top with banding and stringing, carved frieze and square tapering legs. 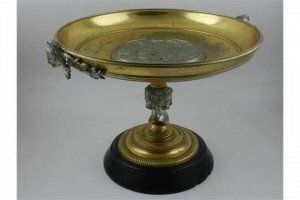 A 19th century gilt bronze tazza, the bowl raised on a support with twin masks, raised on a black marble circular base. 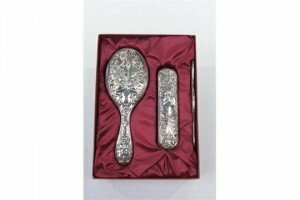 A silver plated cased vanity set Embossed with foliate decoration, comprising; comb, hair brush and clothes brush. 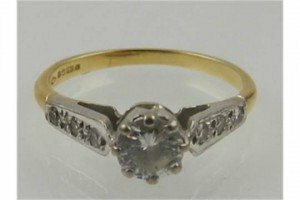 An 18 carat yellow gold and solitaire diamond ring, the stone of approx. 0.34 carats. 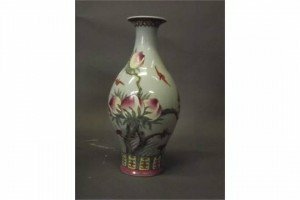 A Chinese celadon glazed porcelain vase with enamel decoration of nine peaches and five bats, 6 character mark to base. 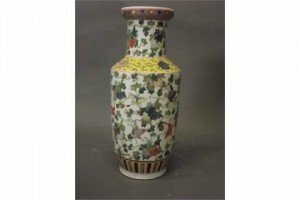 A Chinese famille verte porcelain vase with enamel scrolling foliate decoration and butterflies, 6 character mark to base. 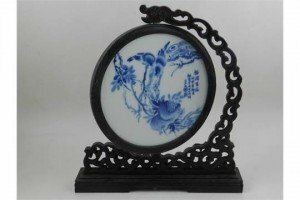 A Chinese hardwood table screen, the central blue and white porcelain plaque decorated with birds eating from a pomegranate tree. 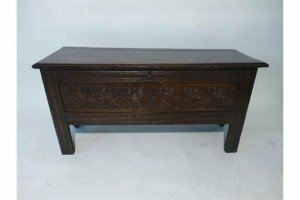 An unusual 17th century oak six plank coffer with lunette carved panel to the front and a moulded lift up lid enclosing vacant interior. 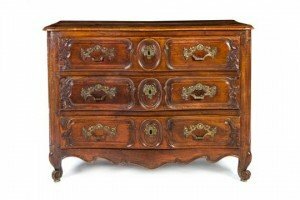 A French provincial walnut commode, having a shaped rectangular top above three long drawers and a shaped skirt, raised on short cabriole legs. 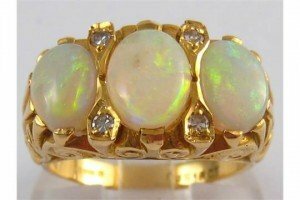 An 18 carat gold opal and diamond ring, hallmarked London 1975. 9.1 grams. 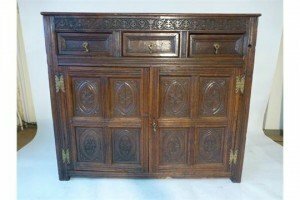 A 17th century and later oak cupboard with an arrangement of panelled doors, enclosing a single shelf below three heavy edged moulded drawers. 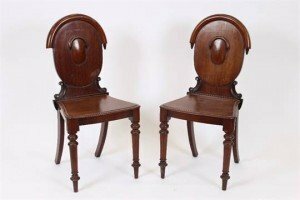 A pair of Victorian mahogany hall chairs, arched backs with oval cartouches, solid seats with moulded outlines, turned and ringed legs. 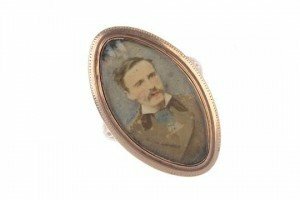 A late Georgian gold memorial ring with later added miniature portrait. Of marquise-shape outline, the later miniature portrait, within a textured border and sides. 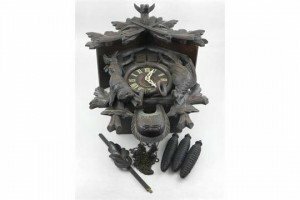 An early 20th century Swiss carved beechwood cuckoo clock, the architectural case mounted with muskets and game, having a Roman dial and chiming gong. 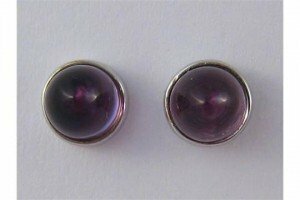 A pair of 18 carat white gold cabochon amethyst earrings by Garrard.